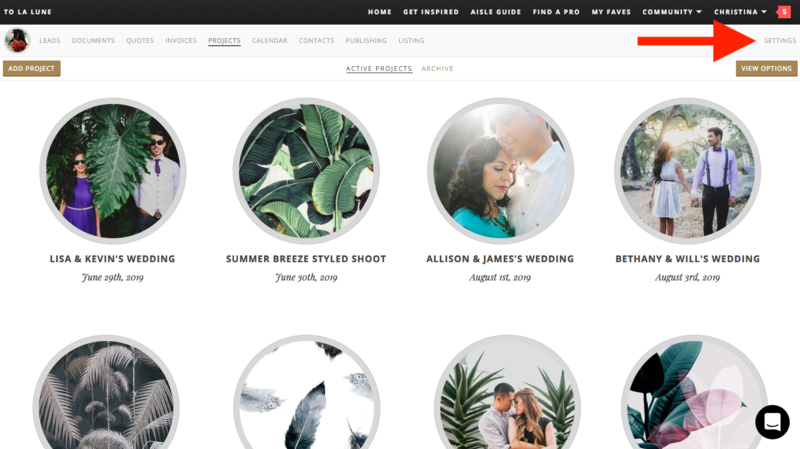 Do you already have a beautifully designed brochure that you'd like to use to create your brochure template in Aisle Planner? Start here! A "brochure" in Aisle Planner can be anything you want it to be when it comes to sharing information with your prospective clients. 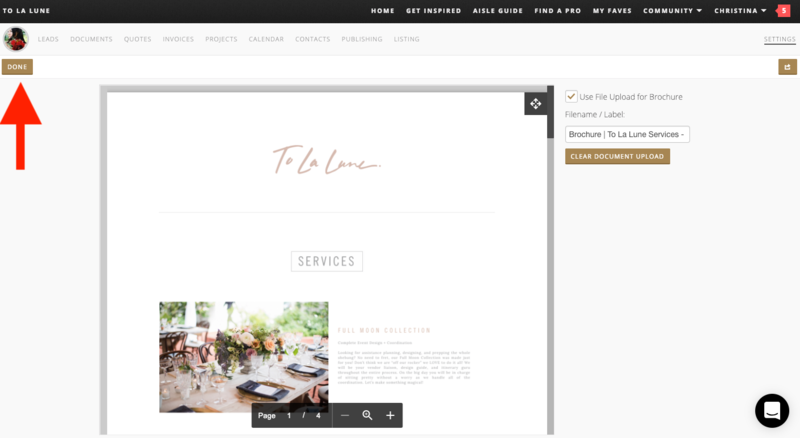 To get started, we recommend creating one beautiful brochure that introduces prospective clients to you, your company and your client experience, so that you can quickly and easily share this information with any new lead that comes your way. 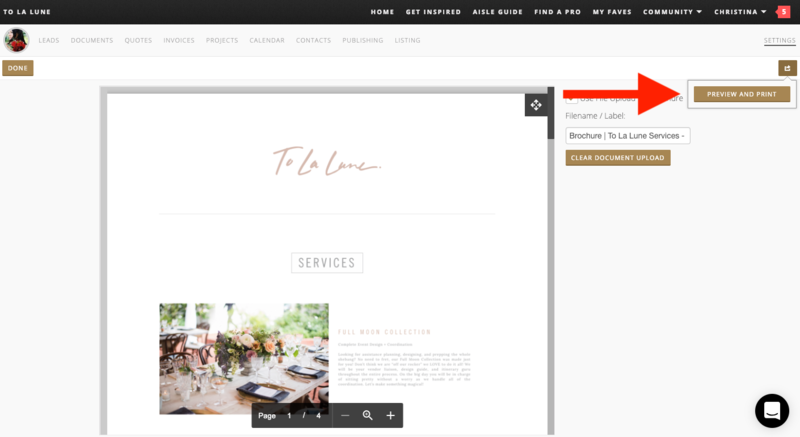 To learn how to create a brochure template from scratch, click here. To learn how to create a brochure template by uploading your own pre-designed brochure, read on below. 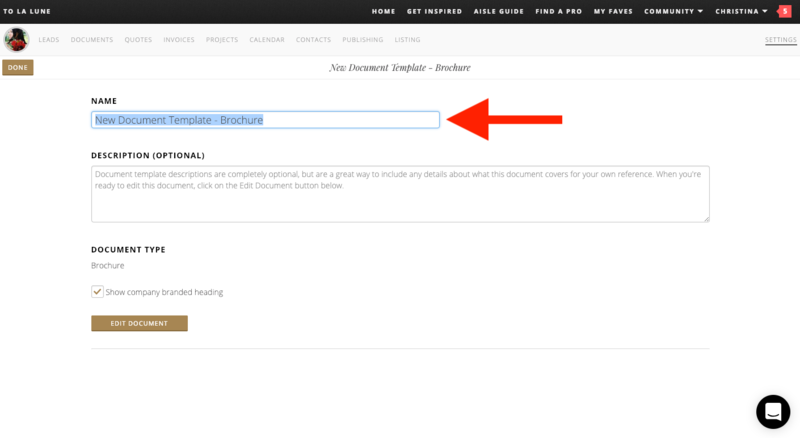 To create a brochure template using your own brochure PDF, head on over to the Settings menu, which you'll find towards the top right of your Pro Dashboard and follow the steps below! 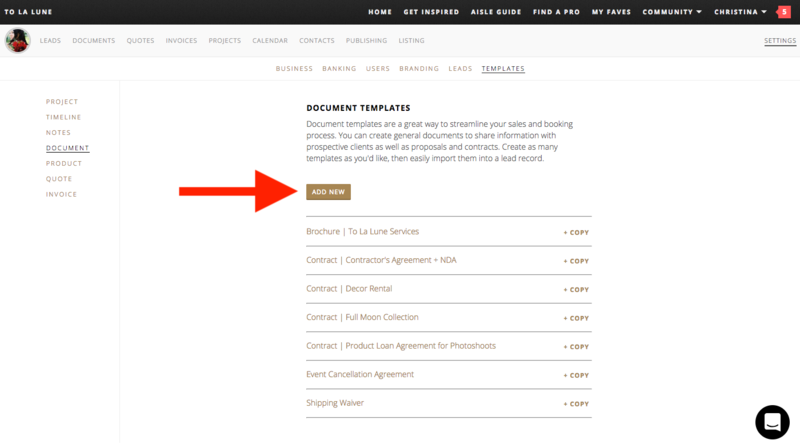 Click on the Templates tab (which you'll see on the left) and select the Documents option. Chose the Brochure option from the menu. 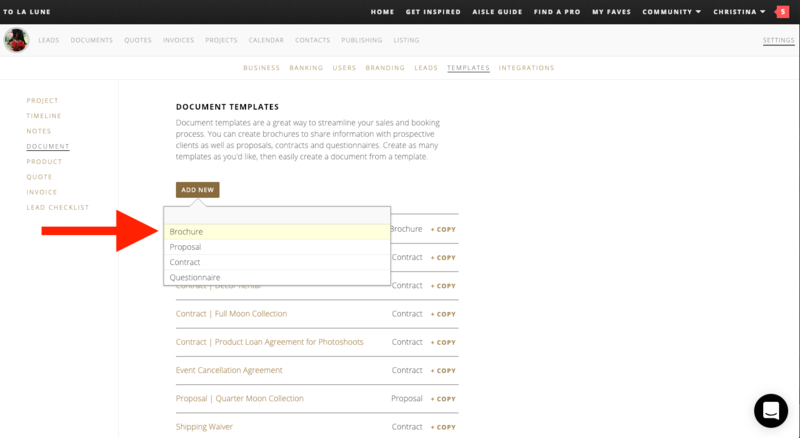 Pro Tip: Since all documents, including proposals, contracts, questionnaires AND brochures are all housed here as document templates, we recommend starting your template name with some indication of WHAT type of document this is, just to make it super easy and straightforward - and since templates are organized alphabetically, it helps to see each type of document grouped together. Note: This description is completely optional and is just internally for your own reference - your clients won't have access to see this! 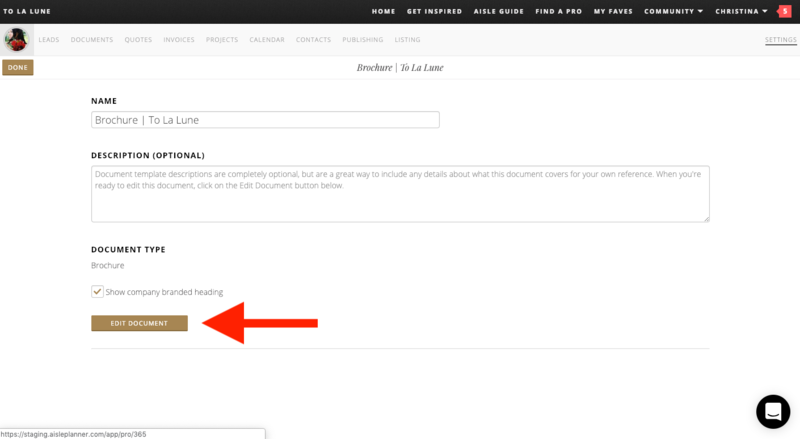 We recommend only adding a description if your template name isn't obvious for your team to understand what the template is for. 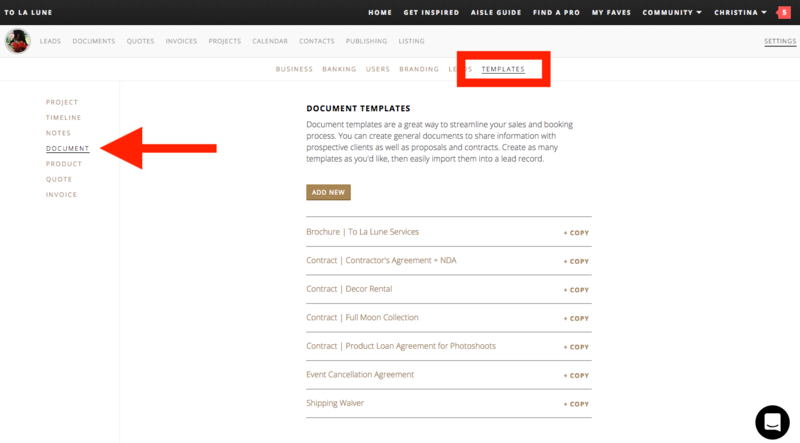 For example, "Platinum Planning" (vs. Full Service Planning) could be confusing to certain members of your team, so you'll want to note that in the description area that the Platinum Package is for Full Service Planning. 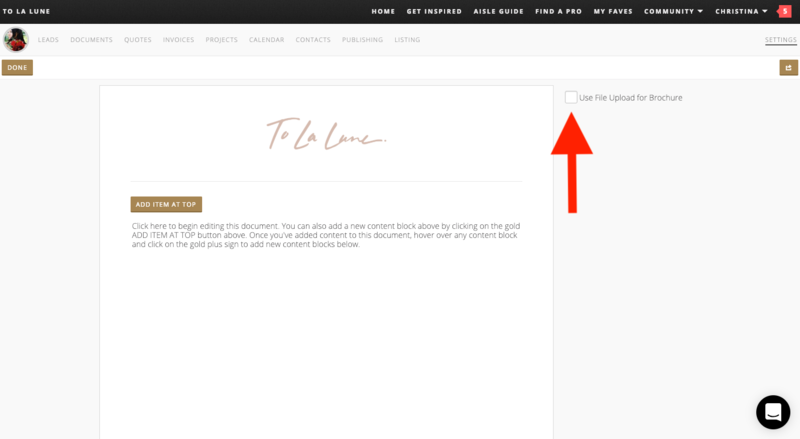 Check the box to enable the "Use File Upload for Brochure" option, then follow the prompts to upload your PDF. Please note: While you can upload additional file types, such as XLS (Microsoft Excel), we've noticed that the Excel files don't translate as well (visually) in the document previewer. For the best client experience, we recommend saving any Excel files as a PDF before uploading to retain the expected format. Once uploaded, we recommend that you take the time to Preview and Print (or just view as PDF) to be sure that everything looks just right. Now that you're set, click on the gold Done button to your top left, and you're set! 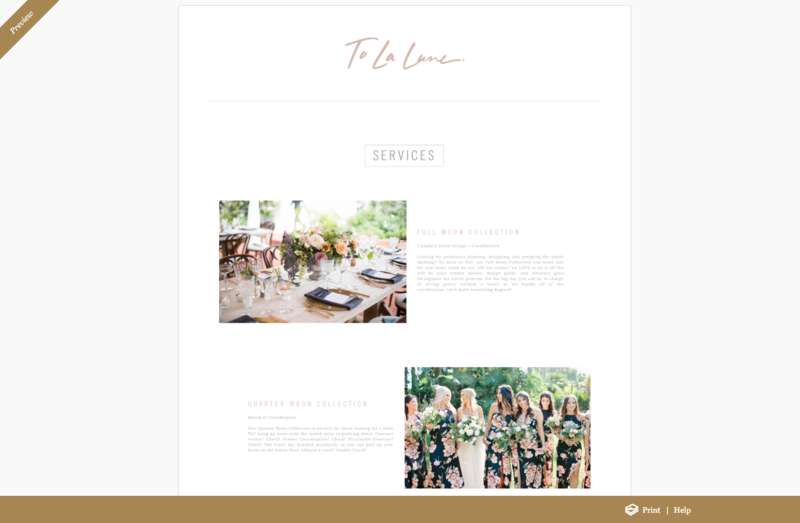 Now that you've set up this brochure template, you'll be able to use this template to quickly and easily send your brochure to prospective clients within a lead record.